As a wide-eyed, newly engaged young thing, I quickly learned planning a wedding takes a village. Whether you’re planning an extravaganza rivaled only by the likes of Jay Gatsby, or an intimate gathering of close family and friends, you’re going to interview and assemble a team of wedding vendors and trust them to help you execute a life-changing event that is special, memorable, and totally unique to you and your fiancé. I can’t speak to the inner life of florists, DJs or cake decorators, but after 3 years as a wedding photographer, I do have advice to help set your expectations and have the best possible experience while taking your wedding photos. Consider the following five points the answers to questions you didn’t think to ask and the solutions to problems you didn’t anticipate--all from the perspective of your friendly neighborhood matrimonial shutterbug! It's okay to feel awkward. Occasionally a future bride will admit to me (in hushed and sheepish tones), "We're not very good in front of a camera," or "My fiancé is kind of uncomfortable having his picture taken." First of all, this is super normal! More likely than not, you and your fiancé are not fashion models. Maybe your last experience taking professional photos was during your senior year of high school. An experienced and talented photographer knows how to make you comfortable in front of the camera. If you’re worried being trailed by a stranger loaded down with loud and obtrusive camera gear is going to make you nervous on your wedding day, try to book an engagement session with your wedding photographer. Couples who book me for engagement shoots before their wedding day consistently tell me it makes a huge difference in their comfort level. I'm always able to help a willing, cooperative couple look their best in photos, so if you're feeling apprehensive, try not to stress! Our insight might be valuable to you. Photographers and videographers are the two wedding vendors whose job is to follow brides and grooms around All. Day. Long. From the early morning makeup session to the last guest who won't get off the dance floor, we ride the wedding-day roller coaster with our clients in a way a cake decorator or a calligrapher doesn't. All that to say, we've been around the wedding world, we've seen some things, and we've got some wisdom to share! I always tell my brides I'm willing to offer as much or little input on timeline planning as they might want. Assuming you have a comfortable, communicative relationship with your photographer, you should feel free to reach out with questions about timing, group dynamics, lighting, and more. You may not realize it, but in your photographer you have an expert wedding resource available to you. Look into the future for a moment to a point in time after your wedding day: What kind of photos will you want to frame and hang in your new home? What kind of photos will you want to give as gifts to family members? What kind of photos will you use as your first Christmas card? This could vary, but for most couples this will mean portraits of the bride and groom together, along with family portraits. When planning your wedding timeline, try to take this into account. Don't allow your poor photographer only 15 minutes out of your wedding timeline to try and snap the most important photos of the day! I encourage brides to allow at least 30 minutes for family portraits (depending how large your family is), and at least 45 minutes to get some classic and creative shots of the newly married couple alone. So when laying out the events of your day, make sure to allow adequate room for what’s most important to you! Don't rule out a First Look. Most brides I work with will initially tell me that they don't want a "first look." They picture a classic scenario of locking eyes down the aisle of a church with their beloved, seeing his reaction to all their bridal glory. I understand how special and crucial that moment is. Believe it or not, doing a first look may actually allow you to enjoy your wedding day more! Couples who do a first look still get photos of that awesome, emotional moment when the groom takes in his bride’s beauty for the first time. They get to react with a little more privacy and authenticity, which can be nice if one or both of them is on the shy side. But best of all,these couples get to head to their cocktail hour and their reception a lot sooner. If you finish those important portraits before your ceremony, then you're free enjoy your guests, relax, and be a part of your own party! I strongly recommend a first look to couples having an evening or sunset wedding, and to anyone who feels a little conspicuous knowing a whole church full of people is hoping to see them cry. It's not about the photos! After all that talk about timing, cocktail hours, and feeling awkward, the most important thing your wedding photographer wants you to know is that it's not about the photos! Even as a Catholic bride, it can be easy focus on the details you've worked so hard to put together; to inadvertently begin thinking the cake, the flowers, the dress and the photos are what’s making your day special. In reality, the inverse is true: the beautiful, important, sacramental commitment you make as a couple turns an ordinary cake into a cake that will forever be special to you. It makes the flowers you choose special, the dress you wear special, and every other aspect of your day. In the end, your photos will be special because they'll help you remember what actually happened on your wedding day--even if the weather was bad, your cake turned out funny, or the best man lost his tie. As you research, plan, and book professionals to help your wedding day take shape, don’t be afraid to ask for their insight and advice. Most wedding vendors--especially Catholic ones!--get into this business because they’re romantics at heart, because they love beauty, and because they believe in the importance of marriage. Most likely, they’ll be ready and willing to help you in any way they can. I hope this insight gave you the confidence to embrace your wedding photos in a new way, and helped supply some ready-made answers to your photography questions! About the Author: Emma Dallman, a Spoken Bride Vendor, is a wedding and portrait photographer serving the East Coast and the world beyond. She lives in the Philadelphia suburbs with her husband Mark and her puppy Hildy. The things that make her happiest include slow weekend mornings, live music, Mexican food and Netflix comedy specials. She is endlessly fascinated by the uniqueness and the beauty of every person she photographs. When speaking of her experiences with either professional photography or her Catholic faith formation, Emma Dallman uses words like “marvel,” and “magic.” Her personal reflections glorify the many divine ways God works in and through this Philadelphia-based wedding photographer as she engages with couples, captures life through the lens of her camera, and pursues each day with trusting humility. As an eight-year-old, Emma remembers snapping through an entire roll of film during the “Shamu Show” at Sea World. The memory stands as a moment she experienced the wonder of photography, which remained a hobby and side-hustle for years. By 2016, she entered more deeply into her desires and began pursuing photography as a business. While witnessing living beauty is a gift of her career, Emma’s goal in shooting a wedding is to create art which memorializes every tiny, beautiful detail of each unique wedding day. Meanwhile, her own approach in relation with couples is organic yet thorough. Such intention engages the “magic of photography,” as shown in her rich, authentic, and emotion-driven photographs. I view it as a privilege to be invited into someone’s “inner circle” on their wedding day. There are so many emotional, joy-filled, imperfect, and sometimes crazy moments you get to witness as a photographer, and those are the moments that make someone’s day unique and memorable. 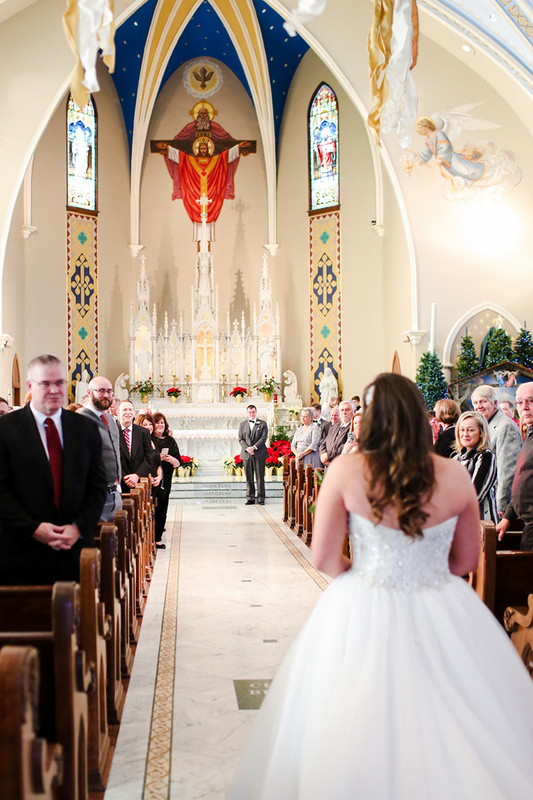 Additionally, I love to capture the beauty of a wedding Mass. I have to laugh when I hear some photographers bemoan the “church wedding” as boring, because from my perspective, nothing could be more dramatic, mysterious or beautiful. Couples who share that idea tend to be drawn to my work. Married love means thinking of yourself second. It's always asking yourself, "How can I help my spouse?" It's evaluating whether aspects of your life are good for them or not. Ultimately, it’s helping the other person get to heaven. Photographing a couple as they enter into the sacrament of marriage always reminds me of the blessing of my own Catholic marriage, and encourages me to go home and love my husband a little better. Place in the world: Yosemite Valley in California. My family and I camped there every summer while I was growing up, so in my mind it’s equal parts nostalgic and majestic. Foods: Mexican. All day, every day! After graduation, Derek worked as a DJ for several of his housemates’ weddings, fell in love with the craft, and began pursuing as much experience and education as possible. He has studied mixing turntables in New York City and sought out mentors in the field, and Derek and his business partner, Wes, founded The Block Party in 2016. When an art you love becomes able to meet a need, it’s hard to see the intersection of your gifts and others’ needs as anything but a call. Derek views his business foremost as a vocation--a perspective that brings particular intention, depth, and sincerity to his client experience. According to Derek, “[this aspect of the job being a vocation] is both our personal journey as we work towards heaven, but also a unique position of being a part of our couples choosing this vocation and helping to send them off on their new journey. Based in the Ann Arbor and Detroit area, serving Michigan, Ohio, Indiana, Pennsylvania, Illinois, and available for nationwide bookings--Derek and his wife are lovers of travel who dream of visiting every continent and DJing a wedding in every state--The Block Party embodies this spirit of vocation in everything from up-front investment info to their fellow wedding vendor recommendations to Derek’s desire to make each wedding the best he’s ever done, not for his own gratification, but out of a desire to serve his couples. Yet as seriously as he takes his business and calling, Block Party weddings are engineered for fun and celebration, involving vinyl mixing and creative, well-thought out playlists unique to each gathering. Music has a power to draw our attention to a particular setting and purpose--that’s one reason why liturgical music, with its purpose of worship and contemplation, is appropriate for a nuptial Mass. In a similar way, the music at your reception can do the same, creating an atmosphere of true joy and emotion that points to a deeper reality. 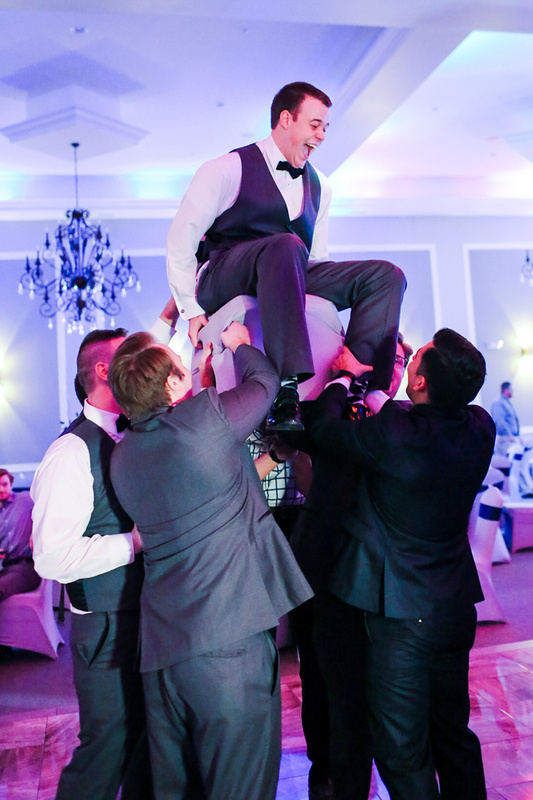 From Derek: DJ culture on the whole pushes me musically, and I've found mentors around the country that have shown me that there is room for a DJ to bring lots of creativity and passion for music to a wedding setting. Redbull Thre3style, Girltalk, and my Block Party partner Wes are all big inspirations musically. My wife and our relationship are a huge inspiration for how I work with people. I tend to pour my heart into things and she is my filter, knowing my love language inside and out, and helping me to channel my love and energy to best take care of our couples and our friends. She grounds us so we can try out crazy ideas and big trips. Our faith as a couple pushes us to take ownership of each others work, to pray for our couples, and to treat this as a vocation first, and business secondarily. We still work hard to be prudent and have a responsibility to be good stewards of our brand, but we want to eliminate all used car salesman feels from how we work. Being honest from the beginning and pouring everything we have into each night out of passion and love rather than obligation has gotten us where we are. Favorite devotion: The Divine Mercy Chaplet. It's very approachable in both length and content and the end includes optional prayer that is so life giving for me: "Eternal God, in whom mercy is endless and the treasury of compassion — inexhaustible, look kindly upon us and increase Your mercy in us, that in difficult moments we might not despair nor become despondent, but with great confidence submit ourselves to Your holy will, which is Love and Mercy itself." Despair, despondency, and a fear of there not being enough compassion are all such powerful things in our lives. This is such a beautiful answer. By the body and blood of Christ there is enough and we can look for the will of God in our lives. Favorite part of working on weddings: Nearly everything. Every week is a new puzzle, a completely different combination of family, location, tastes and a hundred other things. I need to take all of that and bring those people together the best I can, and of course try to foster all the dancing. Weddings are a perfect for playing anything that comes to mind because it is such a celebration of people's lives. We can be playful, nostalgic, and really pull out emotional responses just by playing certain songs. [DJing] is also the perfect outlet for my love language of wanting to give gifts. It is so rewarding to pour years of experience and practice into one night, hopefully making it the best I've ever had, for that couple. Favorite wedding-day memory: My wife and I did our first look on a dock...on a frozen lake...with a nerf gun duel that she didn't know about till that morning. There are so many parts of the day I still love, that were beautiful capsules of our relationships with our friends and family. We did a waltz and an Irish dance together that were also a ton of fun. Favorite place I’ve traveled: Ethiopia. I've been blessed to a do a bit of travel, but this trip was quietly brewing for over a decade. My wife spent a few years in Kenya when she was little and her parents were doing mission work. Her heart has always been tugged towards doing work in Africa, and when we were in undergrad, as best friends, I'd tell her someday she'd find a guy who would get it and be up for the adventure with her. All this time later when we finally decided to date and then marry, and I was that guy, we made a trip to Ethiopia for a week of work, and a week of exploring. It gave me so much more context of who she is. Favorite music: Music is so hard. I love how much music timestamps life. I love learning and growing my music tastes. It's my job, but I also love almost any music I come across. Favorite food: Grilled chicken, pierogies, or salad work any night and are easy to make for guests. Or anything my brother makes. He's a chef in LA and has changed my world about food as an art and science. I root for...the Pittsburgh Steelers, who I’ve been watching with my wife forever, the Detroit Pistons, and Detroit Tigers. I love basketball. Love means...Love is not a feeling or an emotion. So many things happen in life that can quickly totally shake or even break your snowglobe. Depression, putting on weight, losing jobs, and other struggles are things that can happen in life, especially when you are around a friend or a spouse for a long time. You aren't broken if you can't feel. Even in our faith, sometimes we can feel cold and don't feel on fire. God sticks with us and is patient. He offers forgiveness and has shown us how there is beauty and love in sacrifice and pain. Love means persistence, a gentle heart, and vision of someone that goes beyond the last few moments to know the beauty and value they have. Love is doing what we can to get our spouse to heaven. Sometimes cherished friends from the past unexpectedly reappear, and love can flourish even stronger. This was the story with Abby and Blair, who met and became friends in junior high. At the time, their “young love” didn’t last very long, to the disappointment of their mothers. But God had other plans. After going in separate ways after high school, Abby and Blair were suddenly reunited. This time, their companionship blossomed into a deeper romantic love, and they began discussing engagement and their desire for marriage. After a year-long engagement, their lifelong friendship finally transformed at the altar into a lifelong covenant of married love. From The Bride: Blair and I met in the 8th grade. We didn’t go to the same school, but I was on a club swim team with him and his twin sister, Alison. Alison and I became fast friends and began spending a lot of time together. As my friendship with her grew, Blair and I began talking more and eventually starting “dating.” Unfortunately, our young love didn’t last longer than a month. We ran around with the same friend group in high school but never considered dating again. Our mothers always teased us about getting back together. I knew they both would have loved it. After senior year, Blair went on to Wabash College, and I went to Indiana Wesleyan. Later, during the summer before our sophomore year of college, we both ended up back in Kokomo, Indiana looking for a summer job. As I was beginning my search, my grandma told me about an open camp counselor position at the local YMCA summer camp. I thought this sounded fun, especially since I began my job hunt late and had no other pending opportunities up my sleeve. I sent in my application, hoping they still had a spot. My mother, a friend of one of the camp directors, made a call on my behalf. The YMCA told her that they didn’t have any spots left, but they would make an exception for me. I was excited to begin but also a little nervous because I didn’t know anyone else who was working there that summer. Imagine my surprise when I walked in on the first day and saw Blair sitting in a chair, ready for our first team meeting. We exchanged casual hellos and went on our way. But as the summer went on, we began talking more, even outside of camp. I was beginning to really like him and looked forward to the days we would work together. I could tell he liked me too because he starting flirting with me--I mean teasing me. By the end of the summer, we were officially an “item,” and I couldn’t have been happier. We were both a little nervous about going back to school and not seeing each other everyday, but we decided to make it work. I would visit him at Wabash, and he would visit me at IUPUI (Indiana University - Purdue University Indianapolis) . We spent every weekend together and sometimes would even meet half-way during the week. Our mothers were thrilled that we were in love. We began talking about marriage the first year we dated. Somehow, we both knew we wanted to be together forever. So on November 11, at the biggest football game of the year at Wabash, Blair got down on one knee and proposed in front of everybody in the stands. All our family and friends were there. It was the most amazing day and something we will never forget. I always knew I wanted our wedding to be simple and classic. We chose the month of December because we both love winter and the snow that comes with it. Besides, I had dreamed of a winter wedding since middle school. We had a little over a year to plan the big event, which gave us plenty of time. Unfortunately, Blair graduated in May, and I graduated in December, our wedding month. This made planning a little stressful and overwhelming at times, but my mother and close friends helped tremendously. I don’t know what I would have done without them. Our venues were easy to choose. 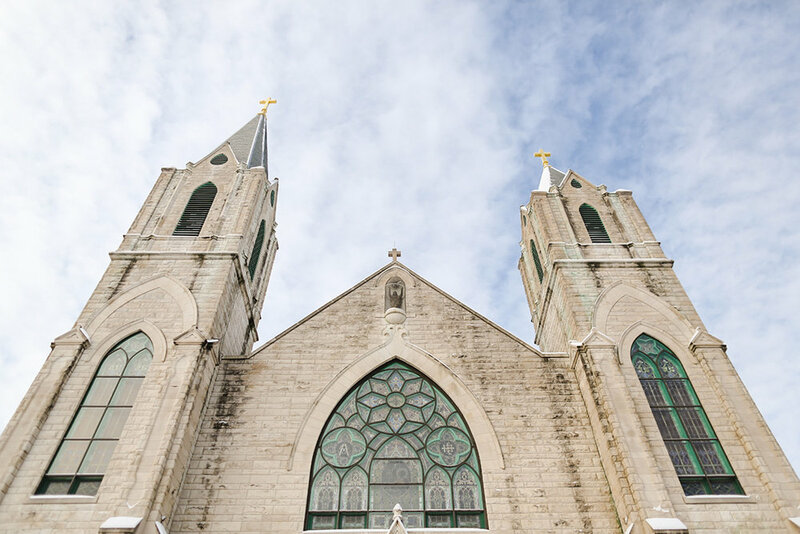 St. Patrick Catholic Church, Blair’s home parish, is not only very special to us, but also the most beautiful church in town. Our reception took place at The Bel-Air, a gorgeous banquet hall close to the church. I was so excited and relieved when we secured both venues. After that, we focused on finding the dress, which was such a fun day. My mother’s best friend came into town from Florida, and we had a great time trying on dresses. I ended up choosing the first dress I put on. It was perfect. After that, everything else seemed to fall into place. Finally, it was the wedding week, and my family from Florida was in town. The night before the wedding, I thought the morning would never come, I was so ready and excited for my wedding day to arrive. I was up bright and early with my wedding party as we left for the salon. My mother and aunt made breakfast, and we all had fun enjoying the whole salon to ourselves while we got ready. After that, the day seemed to fly by. Before I knew it, I was a bride walking towards Blair, and everything else faded away. The nuptial Mass was beautiful and emotional. We were finally a married couple! Then it was picture time. We hid it pretty well, but December 30 was definitely one of the coldest days of the year. We braved the icy wind for some amazing pictures taken outside the church and then moved on to a local mansion. Here we endured the cold again to try and capture sweet memories. Once the pictures were taken, our wedding party jumped into the limo and headed to the reception. My mother had graciously put together a basket for all of us filled with champagne, chocolate, and mints. I’ll never forget spending that special time with our closest friends. When we arrived at the Bel-Air, I was speechless. The hall was absolutely stunning. A few of my mother’s close friends helped decorate before the ceremony, and it was more beautiful than I ever could have imagined. We spent some time freshening up before we made our big introduction, and right after we were announced as “Mr. and Mrs.” we went into our first dance. Dancing with my new husband was a feeling I will never forget. Dinner and dancing followed, along with Blair and I greeting each and every one of our guests. It was so special to be able to personally speak to everyone who attended our wedding. After we got a few dances in, it was time to head out for the night. Before hopping into the limo, we found our both families and gave them enormous hugs. It was such an exceptional day, and we couldn’t have done it without them. Overall, our wedding day was filled to the brim with memories, emotions, smiles, and faith. It was absolutely perfect and everything I had ever dreamed of and more. I know that without God, our marriage would mean nothing. 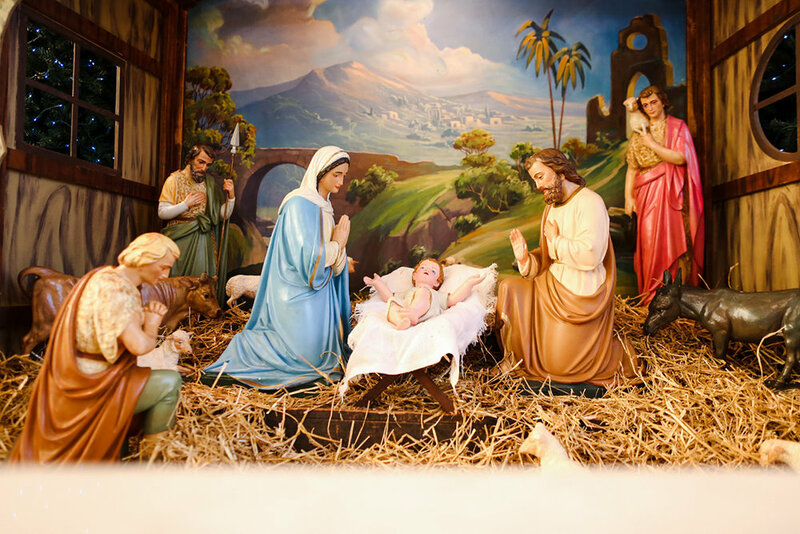 We strove to make our special day all about Jesus, and I feel that is exactly what we did. From the Groom: In the months leading up to our wedding, we were constantly reminded that our wedding day would be life-changing, and nothing would ever be the same after we both said "I do". 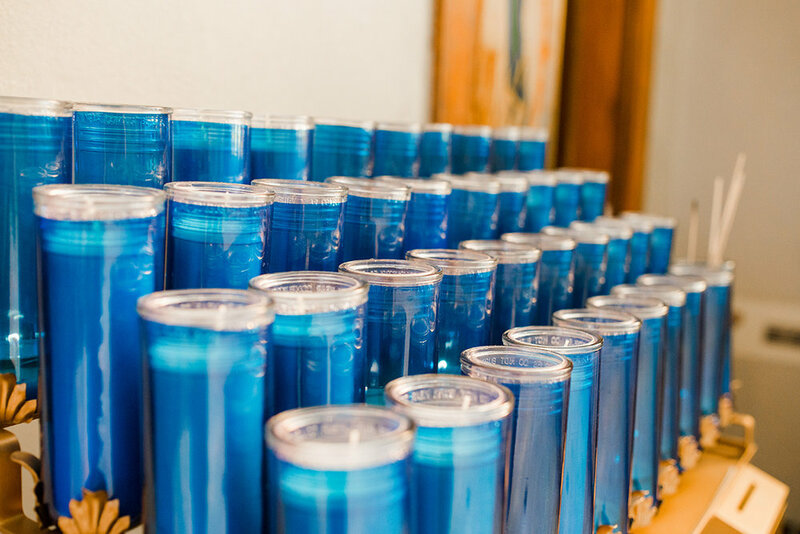 Whether we heard it from friends and family, discussing the sacrament during our Pre-Cana classes, or in everyday preparation for the wedding, we were always aware of how sacred and serious our marriage would be. But it didn't really settle in until I saw Abby walk down the aisle. As she walked to me, remembering all the times I failed her during our courtship and engagement, I knew our union would be a holy imitation of Christ's love for the Church. From that moment on, we would begin to base our lives on the life of Christ, sacrificing ourselves for the good of each other. From the Photographer, Sinikka Roher of Soul Creations Photography: As a photographer, I have learned that when you enter into a wedding day, there are a multitude of points where things can go wrong. However, on Abby and Blair’s wedding day, I doubted those points would come to pass. I noticed the powerful presence of the Lord’s peace when Blair genuflected before entering the church, said a prayer to our Blessed Mother, and was prayed over by the priest prior to the ceremony. And as I spent time with the bride, she reminded me of both Martha and Mary. There was a hustle and bustle to get ready around her, but Abby stood patient and peaceful, waiting for her time just as Mary had. Then, moments before the Mass began, her preparation mindset took over, and I saw Martha in her too. Brides tend to be either a Martha or a Mary, but Abby beautifully embodied both before, during, and after her ceremony. She blissfully walked down the aisle, laughed carelessly at the cold air that chilled her wedding party in the winter weather, and delicately checked in now and then on the timeline of the day. Abby and Blair's big day was one of perfect harmony between the celebratory environment of a wedding and the sacramental beauty of their marriage covenant. It was incredible to capture it in it's entirety. 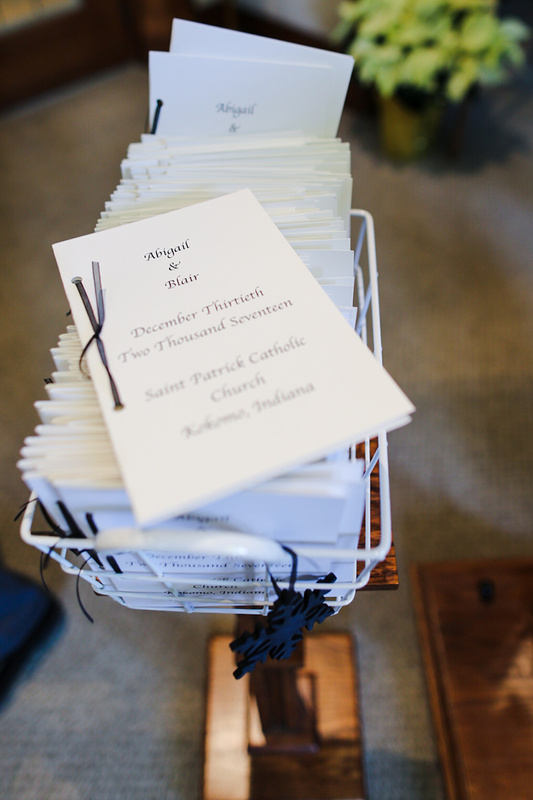 Each day from January 13-20, Spoken Bride's distinctively Catholic wedding vendors will be featured through Instagram takeovers and contributions on the blog. While I was at Mass recently, I was reminded why Jesus says of children, "The kingdom of God belongs to such as these" (Luke 18:16). Next to me, my three-year-old niece was reading a children's missal and following along during the liturgy. When we reached the consecration, the missal described it as the point of the Mass where "the real Jesus" appears. My niece started looking intently around the church. I glanced over at her, sitting on my mother's lap, and watched her eyes slowly fill with tears. I asked what was wrong, and she explained that she "could't find him. Where's the real Jesus?" She burst into tears, burying her face in my mother's shoulder. My niece had such a desire to meet Jesus in person that she broke down when she couldn’t find him. The Eucharist, truly God in body, blood, soul, and divinity, is available seven days a week at my local Catholic parish. When was the last time I wept with childlike longing because I couldn't receive? When was the last time I chose to commit a sin, knowing full well that it would interfere in my relationship with the Lord? It might not seem like the best place to begin planning a wedding, or even thinking about marriage, but a thorough examination of your motivations and your personal failings will ultimately help you grow toward a more Christian relationship, a more relaxed attitude toward your wedding, and a better and holier life. You are not perfect, and neither is your future spouse. "For there is no distinction, all have sinned and are deprived of the glory of God" (Romans 3:22-23). Besides Jesus and Mary (“Our tainted nature’s solitary boast”), there have been no perfect people. You and your partner are likely (though we strive against it with all our hearts) to commit sins in the time that you are together--worse, the two of you are likely to commit sins that directly affect your relationship. You are right to expect your future spouse to be striving for the perfection of virtue, just as you should be, but keep in mind the verse above: all have sinned. The “Good News” is that Christ has provided us with the answer to these struggles: himself. He, being the truly perfect spouse of the Church, humbled himself and hung on the cross for our sins. Shown in this amazing act of ultimate love, he greatly desires your conversion of heart. Have you accepted this truth, and gone to confession recently? Make plans with your future spouse to go together, and definitely before your wedding! Jesus gave the apostles the ability to bind and loose sins (Matthew 16:19), and the priest at your local parish has this same faculty, inherited by merit of his ordination. Our contrition can be expressed to that priest, acting in the person of Christ, and through genuine repentance we can be given absolution for any sin, big or small. That we can be confident in God’s forgiveness through the sacramental ministry of the Church, is one of the most beautiful things about our Catholic faith! Furthermore, you can view going to confession as a powerful step toward a holier, healthier, and happier relationship with your beloved. With a little bit of humility about our own imperfections and a repentant confession, our sins are washed away and our souls made clean. Doesn’t that sound wonderful? However, I have found that it is easier to see imperfections in others than in ourselves. Stephen Covey, in his book 7 Habits of Highly Effective Families, says "We [then] judge ourselves by our motives—and others by their behavior." Ask first if your partner’s actions can be seen in another light, or recognize that they may not be motivated by malicious intent at all. Then examine yourself and ask when you last failed to live up to the call God had planned for you. Act from that place of humility, rather than on your first instincts. Remember to ask forgiveness for the wrongs that you have done them. Make the first move, in love, and you may resolve conflicts much more quickly. If you make this pattern of humility a regular exercise, you will see the fruits of Christ's mercy in your relationship. Your wedding won't be perfect, either. Being a wedding photographer can be a surprisingly intimate experience. I am hired to capture details of someone's life that they often don't share with others. The privilege of listening in on earnest prayers, capturing tears of joy and happiness, and witnessing the unification of two lives is an honor I receive with great gratitude. When I take photos, I try to capture the feeling of the day as the couple experiences it. Bright colors, white dresses, beautiful decorations, and smiling faces are all mainstays of wedding photography. But as with many forms of media, it is easy to get the impression that these perfect images mean a picture-perfect day. Ask any of your married friends about their wedding, and they will tell you (usually after gushing, "It was wonderful!") all about the myriad of small mistakes that were made during planning, at the rehearsal, and even on the big day. In six years as a wedding photographer, I have never seen a perfectly executed wedding. I have seen mistakes and "imperfections" ranging from the very small (processing down the aisle in the wrong order) to the very large (a church so hot that the mother of the groom was hospitalized). There will be mistakes made at your wedding, and no amount of planning may stop them from happening. But if the event isn't perfect, then what unifies the couples that genuinely enjoy their day? In my experience, these couples are those that see their wedding for what it is: an imperfect event planned by imperfect people crowned with a supernatural reality. A couple can be married in front of a crowd of five people just as validly as a crowd of five hundred; they can be married for no money just as easily and completely as they can in a wedding that costs a small fortune; they will still be married if their tablecloths aren't the right color, or if that one relative makes a bit of a fuss. I say these things to free engaged couples from unnecessary worry, not to make them paranoid. If you know, as I do, that an absolutely perfect wedding isn't possible, I hope it allows you to relax and remember the purpose of the day: getting married to your bride or groom. Everything else is ancillary. With this in mind, I advise my couples to schedule ten minutes together after the ceremony without the photographer, wedding planner, mother-in-law, or any guests. The goal is to take in the reality that you are married. Kiss each other, pray together, and then face the rest of your wedding day knowing that whatever else happens, you are now one flesh! No mistake of planning, no social faux pas, and no guest falling face first into your wedding cake will change that reality. See this as an opportunity for humility. Give this special day to your spouse, to your families, and to God. Be confident that, whatever else may happen, God has already accomplished the work of the day. And so, acknowledging all this human imperfection, what is the proper response? The response to our imperfection: Humility. Humility. But is it really that easy? To let all material worries go, and achieve the elusive "perfect joy" of St. Francis? No, it is not, but relinquishing control to God is a huge first step. It is a step to eventually embracing humility as a permanent feature of your life. If pride is the source of all sin, and humility is the virtue that directly combats pride, then embracing humility is a sure route to fighting sin in your relationships with your beloved and with God. Humility thinks first of what your partner needs instead of what you want. Even when their actions are wrongly ordered, humility means forgiving your spouse as you have been forgiven by God. * Humility means holding yourself to a higher standard before encouraging your beloved to do the same. Finally, humility means allowing yourself to be forgiven, both by God and your future spouse, so that you can move past your failings and “live in the truth [of humility]” as Teresa of Avila says. So, let us live in the truth, and humble ourselves before God. Place all of the logistics at the feet of the Lord, enjoy your wedding as it is, and you'll find that the day is made perfect by God present in your union, even without all the perfect trappings. Oh, and that planning detail you’re currently fretting over? Forget it. I give you permission! *In each place where this asterisk appears, the following is a necessary inclusion: The mandate to forgive one another is universal, but there is no such mandate to stay in abusive (physically or emotionally) or dangerous (spiritually or physically) relationships. Please discuss these kinds of issues with friends, family, your priest, a therapist, and/or law enforcement personnel. About the Author: Evan shoots timeless photography and serves the Boston and New England areas. He is available for travel and specializes in Catholic clients. Born in Norway, Evan has 15 years' experience, including six years' worth of shooting weddings. 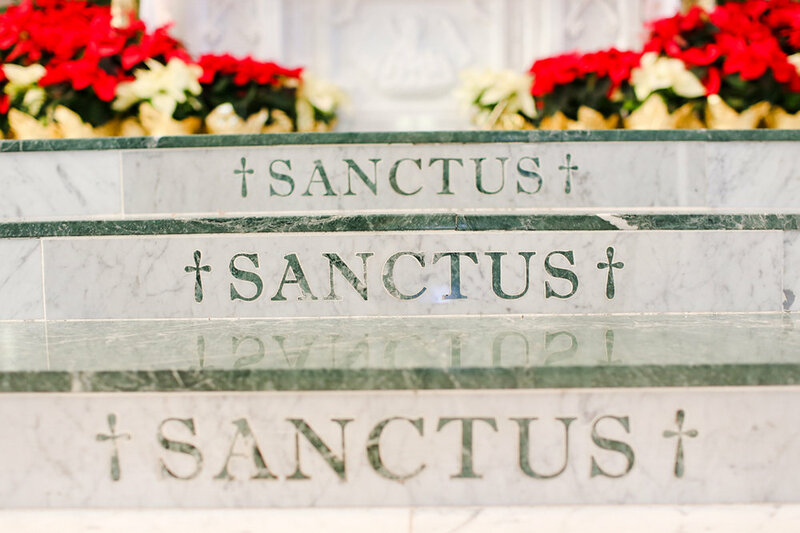 With a great hope in sacramental marriage, he sees love as "making a complete and unreserved gift of yourself to the other."